Albert Camus, the renowned French author and early inspiration to the Cure's Robert Smith, met his end in one of these fantastic, rare luxury cars. 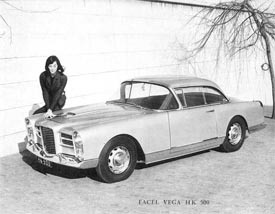 The Facel Vega, unlike the maligned Chevrolet model wearing the same appelation, was a marvelous creation, combining European design with American Hemi power (initially DeSoto, then Chrysler). They're still relatively cheap for such rare cars, and we'd love to see somebody cut one up and drop a blown alcohol Donovan 392 into the engine bay.